The Washington-based Organization of American States (OAS) will be observing the general elections in the Federation of St. Kitts and Nevis next week. 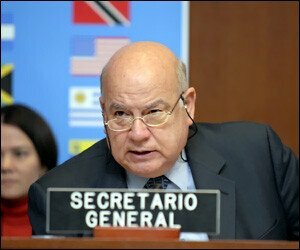 OAS Secretary General His Excellency Jose Miguel Insulza and St Kitts and Nevisâ€™ Permanent Representative to the OAS, Her Excellency Jacinth Lorna Henry-Martin, signed an electoral observation mission agreement on Friday at the OAS Headquarters. The chief of mission will be Ambassador Frank Almaguer. â€œElectoral observations for us are very important and I can assure you, Madame Ambassador that we will have a mission up to the requirements of your country and of your democracy,â€ Insulza told Henry-Martin. St Kitts and Nevis will be choosing its next government on February 16, 2015.
â€œI believe that this will constitute another rung on the ladder of successes weÂ´ve had in the execution of elections that prove that we want to remain among the ranks of those that honor and respect what democracy represents, not only for our nation, but for our peoples,â€ Henry-Martin said.